"What if we offered a prayer for the soul of bin Laden?" The question was tossed into the meeting of the February 20 Movement like a hand grenade. But the young men and women gathered in the Moroccan Labor Union building in Rabat didn't duck for cover. Instead, they angrily challenged the questioner, a bearded, middle-aged man representing the Islamist prisoners who have joined from behind the bars with the secular youth movement calling for greater freedoms. "Are you out of your mind?" asked one young man. "Just because we defend you people against torture, it doesn't mean we support terrorism. Don't you impose your creepy agenda on us." The bearded man beat a hasty retreat. "No problem, let's just do a regular prayer," he said. "We're all Muslims, aren't we?" The meeting had been held to discuss plans for protest outside the infamous Temara detention center, located in a cork-oak forest near Rabat, where terrorism suspects have been tortured, according to Amnesty International. The Islamist may have thought he could set the agenda: after all, his kind had for decades been the only antimonarchy group of any consequence. But as he discovered, change has come to Morocco. It must annoy the Islamists that the shots are being called by these new kids on the block  and that their vibrant activism is shaking up the monarchy in ways the Islamists have consistently failed to for more than 30 years. The kids scored their first big success on Feb. 20, when tens of thousands of Moroccans hit the streets of more than 50 towns and cities, demanding change. The protests had been organized by young independent activists responding to calls made on Facebook. Since that date  so glorious that the youth movement was named after it  hundreds of thousands have demonstrated, at least once a week. The pressure has already compelled King Mohammed VI to promise constitutional reforms, to devolve some of his absolute powers to the elected government. 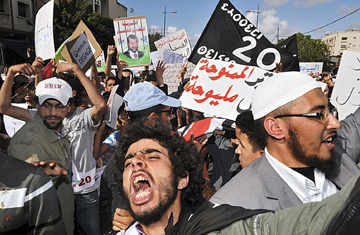 But many young Moroccans want the king to "reign, not rule." The political arm wrestling with the monarchy continues. The Islamists, long thought to have the only grass-roots organization, had no choice but to line up behind the Feb. 20 banner. But the youth set stringent conditions: they would tolerate no Islamic signs or banners, no chants of "Allahu akbar" (God is great), and no segregation of the sexes. It was a revolution within a revolution. Not so long ago, the Islamists were condemning as apostates some of the same youth leaders. In 2009, they launched a Facebook group calling for a public daytime meal during the holy month of Ramadan, when Muslims can eat only before dawn and after dusk. The objective: to "open a debate on freedom of conscience." Predictably, a national scandal ensued. But this was not an isolated instance of iconoclastic behavior. For several years, groups of Moroccans have been using the power of social media  as well as the ability to attract the conventional media  to clamor for the freedom of belief, sexual liberty (notably for gays) and other individual freedoms that had until then been unthinkable. The country's conservative majority was suitably horrified, but the young activists were able to rally growing constituencies among human-rights advocates, leftist groups and the middle-class youth. Even so, the core group of renegades continued to be perceived as little more than a bunch of crazy kids  until they and their sympathizers spearheaded the most powerful wave of change since the kingdom's independence, half a century ago. What are the kids going to do with their newfound status? Nizar Bennamate, a leader of the Feb. 20 Rabat group, says some of their more envelope-pushing demands will have to wait for another day. "For now, democracy is our priority battle," he told me. Fair enough. But sooner or later, this battle will come to a close: Morocco's authoritarian system will irrevocably change, for that is the direction of history. When that day comes, Islamists and secularists will face off for a new fight over the soul of the new Morocco. Who will win? That's hard to predict. But the secular youth have done well to position themselves as the leaders of the antigovernment protests. That planned demonstration at the Temara detention center was brutally broken up by police: 16 protesters were taken to the hospital, but the others reconvened in Rabat's city center to keep protesting. Nobody's calling them the crazy kids anymore. This article originally appeared in the June 13, 2011 issue of TIME Europe.